Earlier this week, I interviewed my husband Michael about some of the human rights concerns in Burma / Myanmar. In his answer, he cited the problem of forced portering, in which the Burmese army takes people from villages and forces them to walk with heavy loads on their backs. This form of slavery has particular consequences for prisoners. While villagers may be used to transport heavy baggage, prisoners – or “convict porters” – are often forced to carry ammunition and act as human shields for the military, walking out in front to test for land mines. 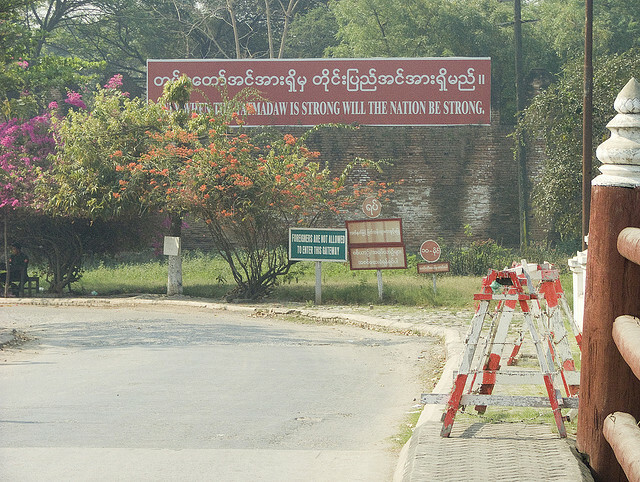 As a result, not only do some convict porters die from making these treks, but many are caught in the crossfire when insurgent armies attack the Burmese military. Forced labor has been a problem in Burma for decades, including the use of child soldiers and slave labor for military purposes. But convict portering stood out to me when I first learned about it because of its connection to my Jewish heritage. Under the Roman Empire, Jews were forced into portering as well. Within the law, Roman guards could find a Jewish person they wanted to punish or harass and force that person to carry their load for them up to a mile. If anyone forces you to go one mile, go with them two miles. Give to the one who asks you, and do not turn away from the one who wants to borrow from you. You have heard that it was said, ‘Love your neighbor and hate your enemy.’ But I tell you, love your enemies and pray for those who persecute you, that you may be children of your Father in heaven. That’s a difficult commandment. For most of us, it can wreck our evening if someone asks us for a ride home or – worst case – desperately steals our wallet for the metro card or gas money. It takes on new meaning when an oppressive ruler demands you walk and potentially die so he doesn’t have to. If your heart goes out to convict porters in Burma and to families of the victims, consider supporting organizations that help persecuted ethnic minorities in the region. Many of them act in secret, but Free Burma Rangers is one group doing widespread reporting on the problems in Burma and working toward peace and relief for the Burmese people. In addition, Better Burmese Health Care and Burma Relief offer health care for some of the poorest people groups. I know a few people who read this blog have close ties to Burma. If you have any other suggestions of groups doing good work there, please do share in the comments!